What inspires your recipe ideas? For me, inspiration comes from so many sources. These days, places like Pinterest are a visual treasure trove of food ideas. It took me all of three minutes on the site to become fully obsessed. 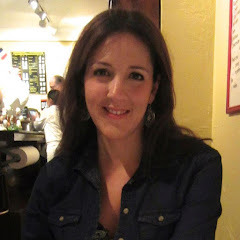 Of course, other blogs offer amazing ideas daily, and when I am feeling old fashioned, I like to page through my cookbooks, ideally while eating food and watching the Food Channel at the same time. 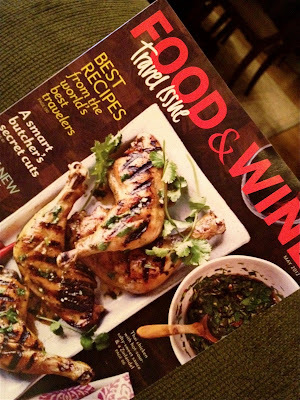 Then there will always be my old standby food mags - Every Day Food and Food and Wine are favorites. Gourmet is great when I'm looking for something fancy schmancy. But by far, my favorite place to gleen inspiration is in restaurants and at other people's tables. See, I'm a menu snatcher. I grab takeout menus everywhere I go. The best are those that not only list the dish, but include most of the recipe components as well. If something catches my eye, I'll sample it and then take note of the ingredients so I can adapt them on my own. Today's dinner is wonderful salad inspired by the cute little modern Italian restaurant, Bruschetteria, on Rivington street in the Lower East Side. Bruschetteria is a favorite of mine because it offers simple and fresh small plates. It was on a trip there some years ago that I first tried their Smoked Salmon and Goat Cheese on Toast Points over Arugula, Capers, Red Onions, with a Lemon Vinaigrette. I enjoyed it so much that I've been making it ever since. 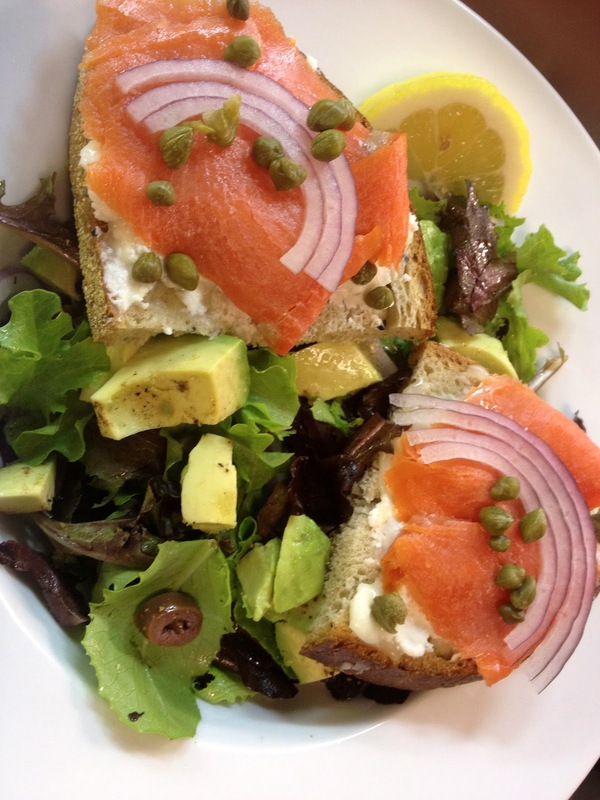 I may be a bit biased because anything with smoked salmon, capers and red onion always makes me a happy woman. The adaptations I've made to this dish over the years are largely to husband-proof it. To give you an idea, the first time I made it, the Mr. asked where the rest of his dinner was. He's a peach, right? Next time, I added an avocado to make it heartier. He also groans when I give him a salad with only arugula. He'll eat arugula mixed with other greens, but alone, he doesn't like it - "too peppery", he says. I now do a mix of field greens with extra bread on the side - just in case he's still hungry. Cut Bread into four even slices, set in toaster. Next, place your Salad Greens into a Large Bowl. Cut Onions thinly into Half Moons. Toss them into the salad greens, setting aside some of the slices to top the Salmon Toasts. Next, slice each Avocado half in a crosshatch pattern as below. Run your knife along the skin all around to separate flesh. Leave Avocado in the skin until ready to use, sprinkle with salt and pepper, and then top with a big squeeze of Lemon. To make dressing, toss 1 teaspoon of Capers in a small bowl with 1 teaspoon Olive Oil and 1 teaspoon Lemon Juice. Mix, crushing some of the Capers a bit with a fork to release their flavor. Set aside. Pop Bread in the toaster oven to toast lightly. Toss chopped Olives into the bowl with the Salad Greens and pour on the Dressing. Toss thoroughly to distribute ingredients and dress. Next, place Avocado on top of Greens. Remove Toast from the toaster and spread each slice with a good amount of Goat Cheese. Top each slice with a few pieces of Smoked Salmon, extra Capers, a few slices of Red Onion from what was set aside, and another big squeeze of Lemon Juice. To plate, serve 2 Salmon Toasts per dish. Perch them atop the salad greens. Serve with extra Lemon wedges.